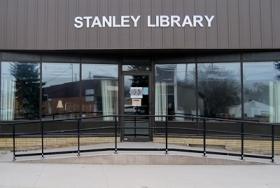 During October, the Stanley Public Library held a Creepy Candy Contest. Students were invited to look at the giant Halloween bowl and guess the number of items it contained. Zoey Marmon was the winner with a guess of 300. The bowl contained 293 items. Annie Roise was second with a guess of 311. Congratulations Zoey and Annie, and to all who visited the library to enter! The contest was sponsored by the Friends of the Library.